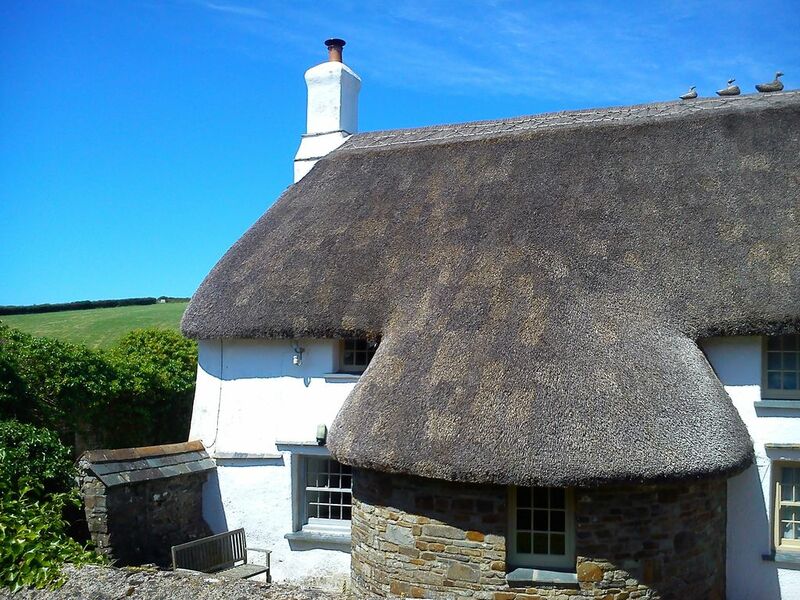 2 Bedroom National Trust Thatched Cottage overlooking Shipload Bay, between Clovelly and Hartland Quay. Walkers Paradise. East Titchberry Farm is in an idyllic location set right on the coastal path in North Devon between Clovelly and Hartland Point with spectacular coastal scenery and beaches to explore. The renovated cottage retains much of its charm and character with exposed beams, inglenook fireplace with wood burner and slate spiral staircase. The kitchen and wet room bathroom offers all modern day conveniences, and although the cottage is attached to the farmhouse you have your own private entrance and sunny walled garden. Guests are welcome to explore the farm and see our Aberdeen Angus cows, Jacob sheep, Oxford & Sandy Black pigs, ducks, geese and chickens. Stunning coastal walks in both directions with Hartland Quay 3 miles to the west and picturesque Clovelly 7 miles to the east. The local village of Hartland, 2 miles away, offers traditional family pubs, coffee shop, convenience store, post office, arts and crafts, and you have many attractions close by including Hartland Abbey, Milky Way, Dartington Crystal, the Big Sheep and the long sandy beaches of Bude and Westward Ho! In 2008, along with my husband and daughter, we moved from Hertfordshire to Hartland in North Devon, taking on a Farm Business Tenancy with the National Trust here at East Titchberry Farm. The farm sits right on the coastal path overlooking Lundy Island and we honestly feel privileged to live here. We farm our pedigree Aberdeen Angus beef herd, our Jacob sheep and our rare breed Oxford and Sandy Black pigs. Farming is a way of life and at times pretty hectic but we wouldn't change it for the world. To wake up every morning and be able to see the sea is still just wonderful. Hartland in North Devon is unique and unspoilt. The entire Hartland Peninsula is in an Area of Outstanding Natural Beauty. The incredible landscapes, clean waters and protected valleys are teeming with plant, marine and animal wildlife. Hartland is part of UNESCO's North Devon Biosphere and Lundy Island is England's only Marine Nature Reserve. Contemporary Shower Wet Room and wc on the ground floor. Separate wc on the first floor. The cottage does not have its own washing machine but you are more than welcome to use ours if needed. The living room has a large inglenook fireplace with wood burning stove and comfortable leather sofas. Free basket of logs on arrival. Satellite TV, DVD and CD player. The dresser is full of books and games. The kitchen has table and chairs, cooker, hob, fridge with freezer compartment, microwave. Hartland Forest Golf Club and the Royal North Devon Golf Club at Westwood Ho! - both 20 minutes away. Notes on accommodation: A warm welcome awaits you with tea, coffee and homemade cake. Our cottage has full central heating and with a wood burning stove makes for a wonderful holiday at any time of the year. The children will love all the animals. We also sell our farm produce e.g eggs, marmalade, beef, lamb, pork etc. Outside: The cottage is adjacent to our farmouse where you have your own entrance and sunny walled garden for complete privacy. Garden furniture and BBQ are provided. Cleaning / Towels / Linen / Maid service: All bedlinen included, please bring your own towels. The cottage will be cleaned before your arrival. A little piece of Heaven in Devon! We booked Sarah and Tim's cottage on East Titchberry Farm for five nights over the Christmas period in 2018, and feel we could not have made a better choice! We were made to feel welcome from the moment we arrived, and the little touches that Sarah had waiting for us were lovely! The cottage is just perfect in every way, quaint, creaky, but with every mod-con you can think of, and so comfortable and cosy! We loved getting the wood-burning stove going every afternoon, and it just added to the cosiness! The kitchen is so well-equipped we managed to cook a full Christmas dinner - turkey and all the trimmings, and the wet-room shower was just amazing!!! We also had the best night's sleeps too - with nothing but the sound of the farm animals and bird song to keep us company!! Situated a five-minute walk from the stunning North Devon coastline (and the South West Coastal Path) we were able to get out and do some walking, and the lovely villages of Hartland, Clovelly, Stok and Hartland Quay are just a few minutes drive away, and even Bude (just over the border in Cornwall) is a 30 minute drive and has a fabulous beach!!). The few days we spent on the farm were just enough to recharge our batteries after a hectic last few weeks of the year, and we left feeling relaxed and completely destressed!! Thank you Sarah and Tim for allowing us to share your lovely home, and I guarantee we will be back!! Nice for family of 4. New born Piglets we’re gorgeous! Idilic cottage within easy walking distance of Hartland peninsular with unspoilt coastline. Also the cottage is in a good position for exploring the rest of beautiful north Devon and Cornwall by car. After being out all day looked forward to returning for food and wine and a log burner! Will definitely be back to stay for longer next time. Highly recommend. We totally enjoyed our stay - very nice cottage, very nice location and really very, very friendly hosts - thank you, Sarah and Tim ! Lovely little thatched cottage. The usual low ceilings, wonky walls and small windows, but with a few extra quirky features - 2 doors into the living room being one ! Great wet room with a brilliantly powerful shower ( great for washing down muddy dogs). Staircase was quite a challenge and not suitable for the less able or unsupervised young children. Friendly and helpful hosts. A freshly made cream tea on arrival was very much appreciated. The cottage was comfortable, clean, well equipped and well maintained. We had a lovely time relaxing in the cottage and exploring the area, as much as weather permitted!! At East Titchberry Farm Cottage in Hartland, North Devon, the South West Coast Path is 200 metres from your front door. The farm overlooks Lundy Island and has stunning views over Shipload Bay. Hartland is in an Area of Outstanding Natural Beauty and you are perfectly placed on the Hartland Peninsula for a number of fantastic circular walks taking in the stunning coastal and inland scenery including Clovelly, Brownsham, Hartland Abbey, Spekes Mill Mouth and Hartland Quay. Hartland has thriving arts and crafts where you can join informal pottery classes and art classes. There are many coves to explore along the coastal path in either direction. The larger sandy beaches at Sandymouth, Bude and Westwood Ho in North Devon are a short drive away. Visit Lundy Island with its amazing wildlife and timeless beauty, with day trips available from Bideford or Ilfracombe during the summer months or by helicopter during the winter. Hartland Quay - 3 miles. Bude and Bideford - 15 miles. Booking Notes: Please email or telephone for a booking form. Short breaks are available out of the high season - please ask. 2 nights are 50% of the weekly price, 3 nights are 60%, 4 nights are 70%, 5 nights 80% and 6 nights are 90%. Changeover Day: Saturday is the usual changeover day but we can be flexible out of season and for short breaks. Please ask. Notes on prices: Prices are for the property per week in UK Pounds. Can accept Euros. Discounts for 3 week bookings - 3rd week half price. Short breaks available outside peak times - please ring or email for price and availability.